Location contains "Philadelphia, Pennsylvania "
John Lewis and Delia King’s Leidy School Mural is in West Phildelphia. Painted in 2004, the mural fuses history with contemporary scenes of children playing. The young African American children to the right-hand side of the mural are positioned inwards, absorbing the history of their city. The antislavery leader, Frederick Douglass, looks out to the viewer. 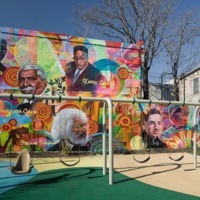 On May 25, 2011, a mural titled The Faces That Shape Us, was dedicated in Uncle David’s Playground. 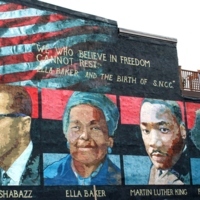 Mr Kenneth Gamble (pictured on the mural), the founder and chairman of Universal Companies, had bought a rundown building in South Philadelphia and tore it down. He wanted to bring something positive to the neighbourhood and so he funded a local children’s playground, complete with a mural. Muralists Keir Johnston and Ernel Martinez started the mural in the summer of 2010. 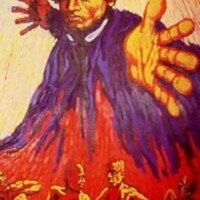 The mural features Frederick Douglass and other historical figures such as W.E.B. Du Bois, George Washington Carver and James Baldwin, as well as local figures Dr. Emmett Chapell, Judge Frederica Jackson, and Faatimah Gamble. 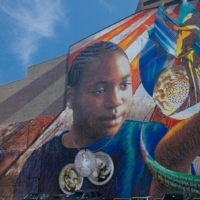 The mural was developed through a partnership with Universal Companies, the Philadelphia Prison System and the City of Philadelphia Department of Human Services. 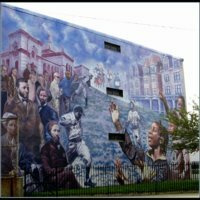 In 2006, muralist Joseph Tiberino, along with his sons Gabe and Raphael, painted Wall of Black Heroes for the African American Museum of Philadelphia. When creating the mural, the idea was to provide a portable piece of work that would later be housed in the streets. Measuring 4ft by 12ft, the mural was created on such a scale so as to provide the audience with the sense that the figures of history were life-size. 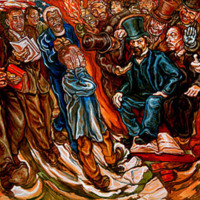 The mural takes the audience on a historical journey, starting with a self-emancipating shackled slave, then moving to the abolitionists Frederick Douglass andHarriet Tubman, then Angela Davis and Malcolm X, Spike Lee, Paul Robeson, Louis Armstrong and Martin Luther King Jr. The mural is now on the side of the Municipal Services Building next to City Hall.